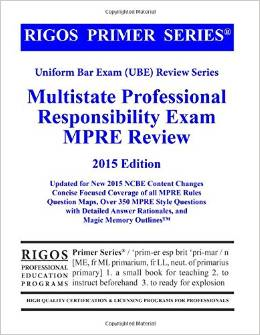 The Rigos Bar Review Series Model Professional Responsibility Exam (MPRE) review material is all you need to score high on the Uniform MPRE administered by the National Conference of Bar Examiners (NCBE). This book provides valuable insight into the nature of the MPRE and an analysis of the question characteristics. Readers also benefit from learning about the MPRE process, question characteristics, and related suggested approaches. Also detailed is our recommended organized preparation program to ensure you achieve a high score on the MPRE at the first sitting. Included in this book is an exam-focused summary of the ABA Model Rules of Professional Conduct and Model Code of Judicial Conduct which could be asked in a performance task. The concise and focused explanations of the most frequently tested MPRE questions is helpful. This book also offers a “Tips and Traps” section to help familiarize you with typical distracters used by the examiners to confuse the MPRE exam-takers. We provide advice on the best approach, time scheduling, and format for answering the MPRE questions. This helps increase your abilities to analyze answer choices. This book also contains over 350 helpful simulated exam questions categorized by topic with full answer rationales to help you gauge your progress.